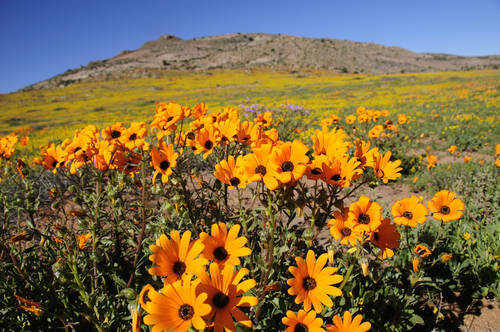 The Cape Town wildflowers are known worldwide for its stunning displays in springtime. 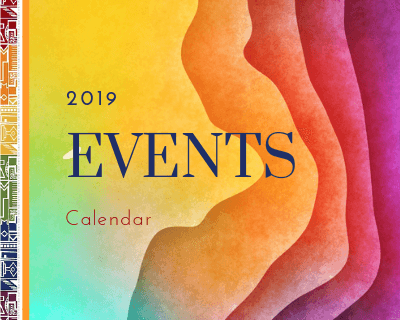 Now that the new dates are for this year are published, we are pleased to share here our updated page for the wildflower season 2019. Here you will find some ideas where to go and when to see the wildflowers in bloom. Be sure to fit in at least one day of flower spotting when staying in Cape Town during August and September. It's really worth it! You will see wildflowers in an array of colour also if you venture a bit out of Cape Town, drive north on the R27, this is where you can see the first vast flower fields just outside Blouberg. Make sure to also visit of one of the many Wildflower Festivals which take place during late August and September. Then the various communities celebrate spring with skillfully decorated town halls or church halls displaying of the typical spring flowers of the West Coast region. At many flower festivals, there will be also arts exhibitions, lectures as well as markets with craft and food stalls which complement the unique experience. 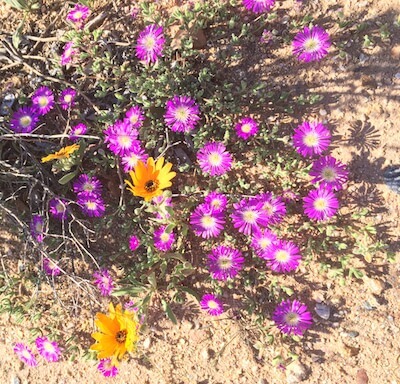 Especially the northern parts of the Western Cape and the Northern Cape are renowned for their mesmerising beautiful wildflower displays during spring, mainly from August to September. Visits to the following spring flower festival events are all easily manageable on day trips from Cape Town and always perfect for an exciting weekend getaway. Visits to the following spring flower festival events are all easily manageable on day trips from Cape Town and always perfect for an exciting weekend getaway. The carpets with bursts of vibrant and colourful springflowers can be seen everywhere in and around Cape Town at this time of the year. For visitors to the Mother City, the Botanic Gardens at Kirstenbosch are the first place to go to. Read more about Kirstenbosch Gardens here. The Postberg Nature Reserve near Langebaan is only an hours drive north of Cape Town. The R27 brings you right up to the West Coast National Park, a Nature Reserve where you can not only admire the colourful wildflower carpets in the northern Postberg area of the park, but also where your kids can already have a refreshing splash around in the turquoise Langebaan Lagoon on a warm sunny spring day. More info. Visit this popular annual event to enjoy the stunning fynbos in bloom. Tractor rides, mountain bike race, plenty of food stalls (also fynbos honey tasting) and lots of entertainment for the whole family. More info. Visit this annual event to enjoy the stunning Wildflowers. Clanwilliam Church which is locally known as the 'Blomkerk' (Afrikaans for 'Flower church') will again be splendidly decorated. Please note that entrance fees will apply. 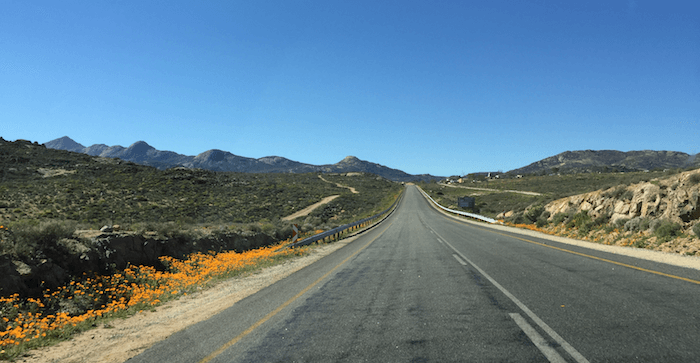 Clanwilliam is located roughly two and a half hours drive north east of Cape Town. And the majestic Cederberg Mountains are always a great getaway for a weekend. More info. One of the oldest wildflower festivals in the West Cape Coast Biosphere is this festival which is organized by the Darling Wildflower Society. More info. This nature reserve on the outskirts of Melkbosstrand is the closest reserve to Cape Town with beautiful wildflower fields. It is located in the areal of the Koeberg Power Station. There are also zebras and springboks in the reserve. Take your bikes and enjoy cycling in the stunning pristine nature - even if it's next to the cooling towers. Get more info. This nature reserve is strictly speaking along the West Coast but much further north, about 500km/6 hours from Cape Town. Still this is a beautiful drive up north for a long weekend. More info. Also highly recommended is the Nieuwoudtville Wild Flower Reserve. More info. In the Karoo Desert National Botanic Gardens you will admire Namaqualand daisies in bloom and the magical koekerboom trees which are a must see when in Southern Africa too, so make sure you plan a visit of this beautiful landscaped botanical gardens when you live in Cape Town as it is only one hour away by car (120km north of Cape Town). More info. The Overberg town of Caledon lies 120km east of Cape Town, just off the N2. The area around Caledon is known for its scenic beauty, so well worth a visit. Visit the Caledon Wildflower Garden during the season. More info. Read more on the attractions in the area and about the Cape Country Meander here. The best place to see the various spring flowers is the National Botanical Gardens in Cape Town. Take a walk around the botanic garden, visit the little art gallery or relax in one of the coffee shops to take in the atmosphere. Enjoy the brightly coloured daisy fields, vygies, watsonias, strelitzias (as shown on the image above) and arum lilies. Read more about Kirstenbosch here. Go for extended walks in the Table Mountain Nature Reserve such as the Silvermine Reserve, Elephant's Eye or Lionshead just above the city or even hike up the Mother City's iconic landmark to see the Cape Town wildflowers. For those who rather enjoy the one-hour walk on the Table Mountain mountain top, take the cable car up and be mesmerised by the sparkling beauty of Table Bay as well. 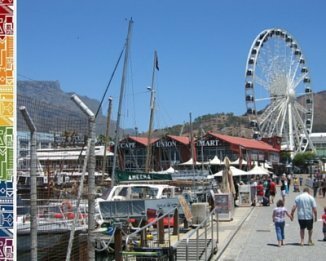 Read more about Table Mountain excursions here. Enjoy the beautiful Cape Town wildflowers and spring time in and around the Mother City. Any tips or comments about the Cape Town wildflowers? Please contact us.